Take into account that this first section isn't the activity yet. It is meant to show you how to work with the Linux permissions system. Log in the system with your admin user. 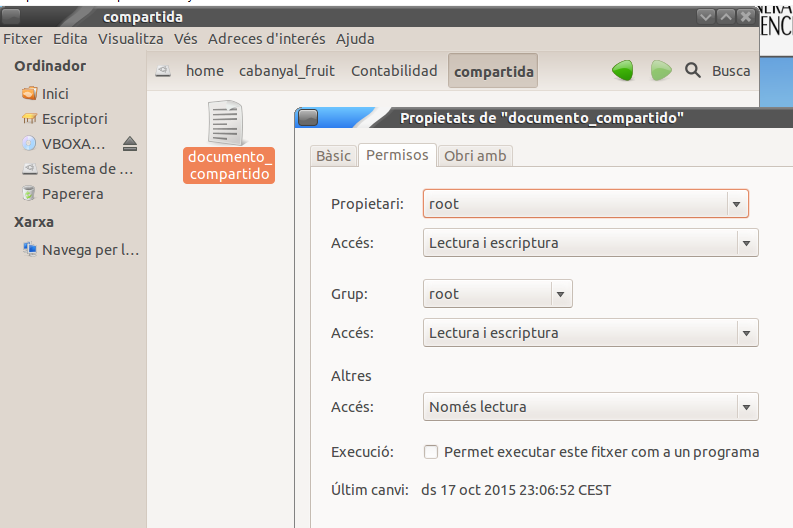 Select Equipo in the panel on the left , to place yourself in the linux root folder, and see the whole tree of folders Doble click in the folder Home, and later into elcabanyal_fruit. 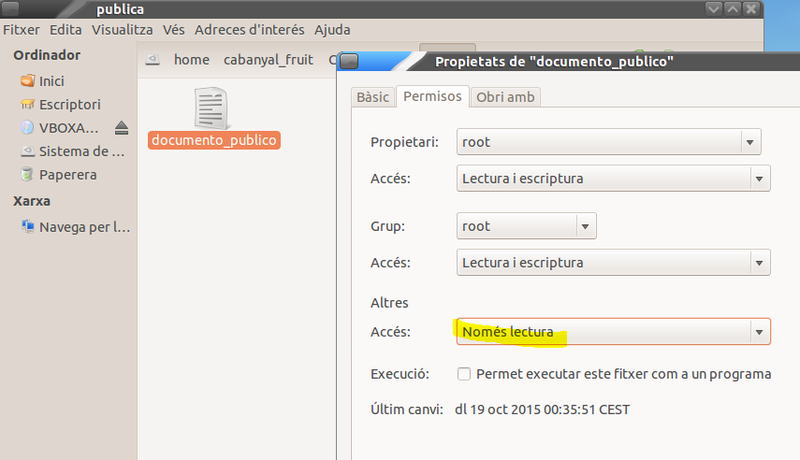 Now, get the properties tab of the documento file in any of the compartido folders. 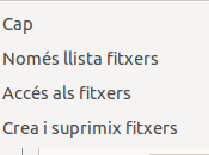 Notice how the properties window still references the propietario, grupo and otros but the permissions are slightly different in a file than in a folder. Sólo Lectura: The file can be read, but not written. Lectura y escritura: The file can be read and be written. Now start the real activity. Click on Cambiar permisos a los archivos contenidos to deploy the pop-woindows shown below. 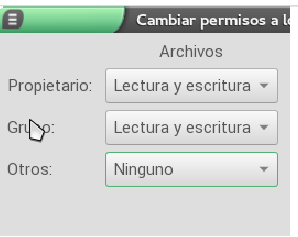 Clic on the otros pull-down menu in the Archivos column and select the option Lectura y escritura. Let's begin changing the ownership of each deparment folder. Keep in mind that a folder is owned by the user who created it.. And you have created all the folders with an admin Nautilus, so, all the folders belong to the ROOT user. In this step we are going to make the heads of department owners of their department folders and files. The Heads of department should be allowed to perform any action in their folders. 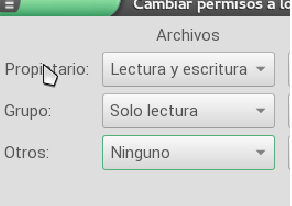 The department workers should be able to list the folder contents and acces the files, but can not modify them. For the group empconta set the option acceso a los ficheros in the restringida folder. For the otros group set the option ninguno in the restringida folder. Log in the system as a Contabilidad worker, for example Constancio. 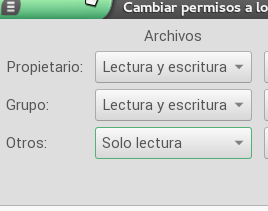 Comprueba que el fichero ejercicio 3 se ha creado en tu carpeta personal, y súbelo al moodle.